Without Intervention, Lions Heading For Extinction The worldwide lion population has declined a staggering 90 percent in the past 50 years. 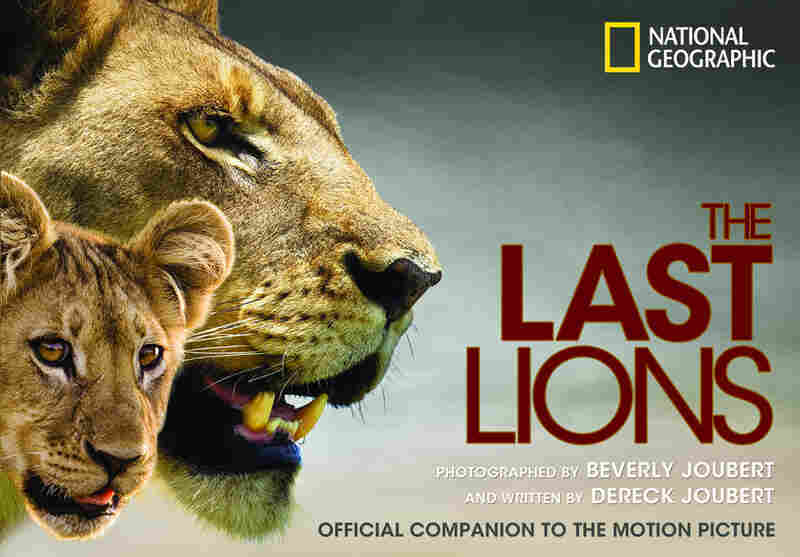 In their documentary The Last Lions, conservationists Beverly and Dereck Joubert track the giant hunters across Bostwana and warn that without intervention, lions may soon go extinct. In "The Last Lions," filmmakers Dereck and Beverly Joubert follow a lioness trying to provide for her cubs and protect them from a rival pride after her mate dies. 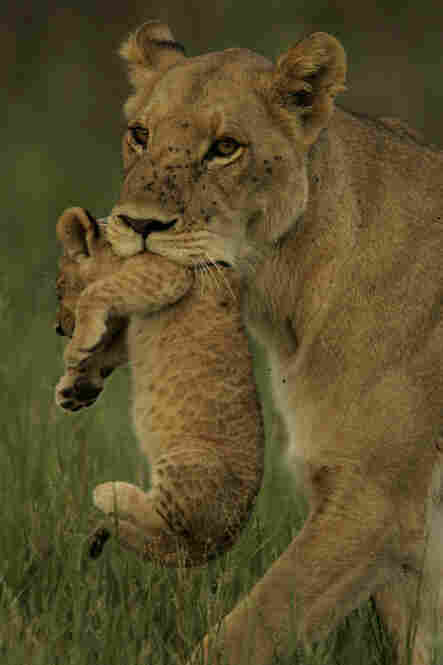 The lioness, whom the filmmakers have dubbed Ma di Tau, finds herself struggling to hunt alone with cubs to feed. 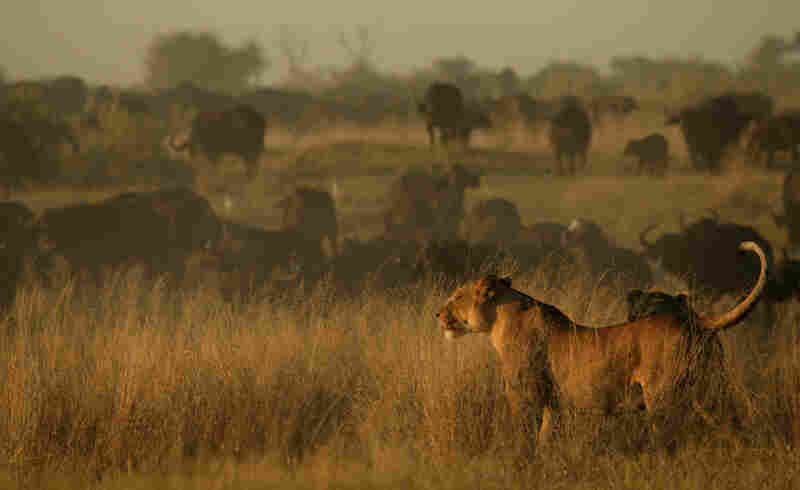 The lioness takes her pride to an island in Botswana's Okavango Delta that is populated by buffalo. Although the buffalo are one of her biggest threats, they are also one of her best hopes for survival if she can prevail over them. Lions traditionally hate water, says Beverly Joubert. But Ma di Tau crossed muddy streams to find a new home for her cubs. 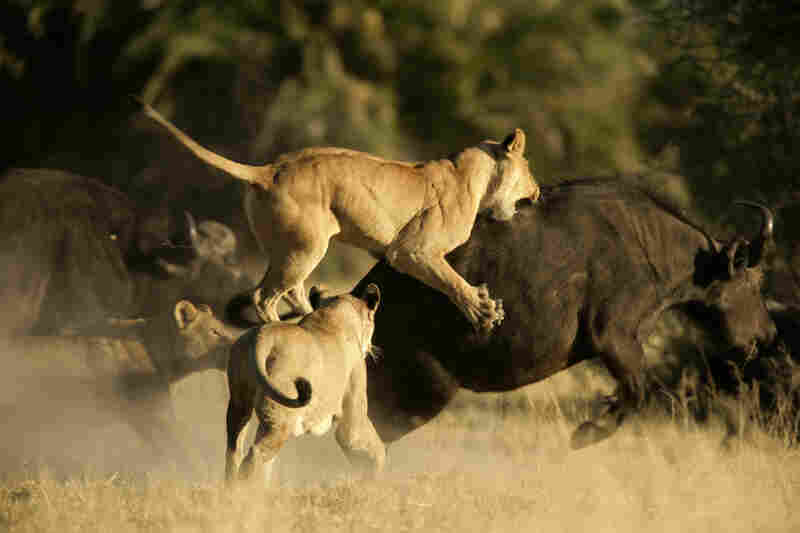 A pack of lions attack an African buffalo, while swarmed by the rest of its herd. A lion relaxes on Duba Island. In the last 50 years, lion populations have plummeted from 450,000 to as few as 20,000. The Last Lions book is a companion to the documentary, which is now playing in select theaters. 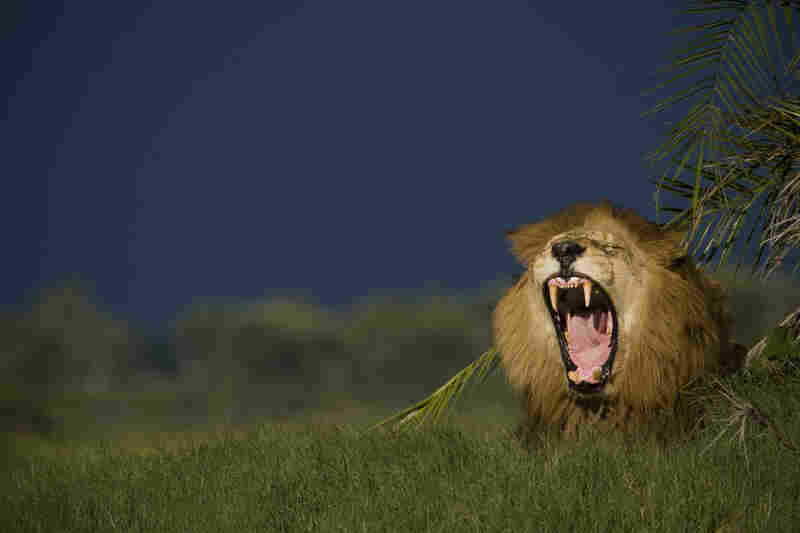 "Marauding lions [come] in from the outside into their territory and fight with them," says Dereck Joubert. "These territorial battles are dramatic and often end up in death one way or another." But obtaining dramatic footage of lions battling each other in the murky, swamplike Okavango Delta is not easy, even for seasoned documentarians like the Jouberts. They followed lions across river systems, pushing their car into chest-height water while driving — and they often had a front-row seat to heated attacks. "Generally, we're situated about 20 to 30 paces from the action," says Dereck Joubert. "It's fairly chaotic. You never know where it's going to come from, where it's going to end up. Often, the action breaks closer to you than the ideal." If the action breaks closer, the Jouberts are able to remain calm and in their vehicle — which doesn't have doors, a windshield or a roof — because, says Beverly Joubert, experience has given them insight into how the aggressive cats are likely to react. "We believe that our knowledge over 28 years has prepared us to keep safe, and it's kept us being good filmmakers, without ever challenging the animals, without wanting them to give us an incredible aggressive look," she says. "We feel like the luxury of time will eventually give us that look, but we never, ever want to threaten an animal. At the end of the day, it's all about respect and having ultimate respect for these animals." Dereck and Beverly Joubert are explorers-in-residence at National Geographic. They have worked on big cat documentaries for more than 25 years. 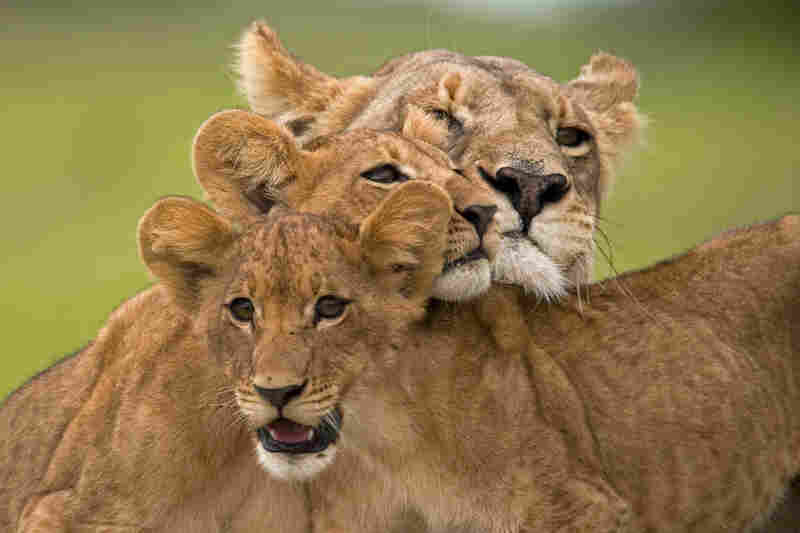 In The Last Lions, the Jouberts focus on one lioness who tries to protect her three cubs from a vicious rival pride — by herself — after her mate dies in battle. Usually, a lioness will have a pride of female lions providing an additional layer of security for her cubs. But not in this case. "For her, the stakes were doubly high," says Dereck Jouter. "She had lost her mate and her protector, and she had to go out and hunt — a very, very dangerous activity — and make sure she didn't get injured long enough for her cubs to be vulnerable and in jeopardy." The lioness — who the Jouberts dub Ma di Tau — decides to find a new territory for her cubs. The Jouberts tracked the lions as they made their way through muddy streams in an attempt to reach an island where, unbeknownst to Ma di Tau, a herd of buffalo live. "Their horns are incredibly sharp," Beverly Joubert says, "so that was a problem. Her initial stages [on the island] were having to learn how to hunt. And she studies them. You see she's watching, she's studying them. And she tries to take the [buffalo] calves. But in the finale, she is hunting a male buffalo bull." Learning to fight buffalo wasn't the only way Ma di Tau had to adapt. In order to save her cubs, she took them through water. And lions, Beverly Joubert says, traditionally hate water. "Crocodiles live in water. 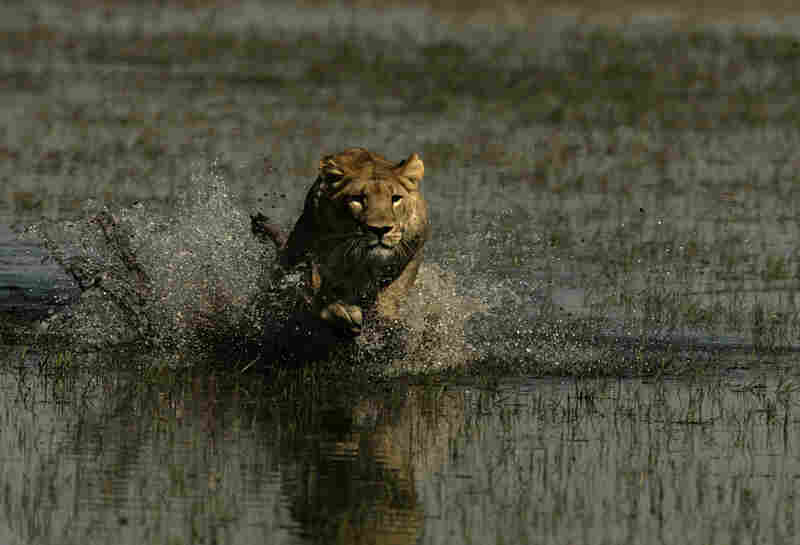 And even without crocodiles, lions aren't even comfortable getting wet when it's raining," she says. "These lions truly had to adapt." At one point in the film, Ma di Tau leaves one of her cubs behind after he's injured. It's heartbreaking, Dereck Joubert says. "While we can't anthropomorphize, we can certainly understand that there's something going on," he says, adding: "For us, this moment was much more about [Ma di Tau's] struggling with that inevitable maternal instinct to stay and to take care of the cub when she knew she didn't have the capability." Beverly Joubert: "That definitely would have been crossing a line for us. We made a policy years ago that we're out there to document. And that's what we do. We'll never intervene when it's a natural situation. So when it's nature playing out its game — without human interference — then we are completely hands-off and all we do is document, even though it's painful. But if we see a situation that is a man-made situation — for instance, an animal falling into a man-made waterhole or a snared animal or poachers shooting at animals — we do, we go straight in. We've had this happen before, when poachers have been shooting into elephants, and we're not even thinking about our own safety. We've driven straight toward them to confront them, and hopefully they will stop shooting." Dereck Joubert: "What we are very, very careful about doing ... is being careful about how we deal with what are obviously emotions within these animals. So we never, ever say, 'This animal is feeling sadness. And this animal is feeling hatred,' or any of those sort of things. What I try to do very carefully is say, 'We don't know about animal emotions, but any mother who loses her young must be going through something.' So I'd like to take people up to that point and then do a handover because it's very, very obvious that these animals do have emotions, but exactly what forms those emotions take is where we have to draw the line." Beverly Joubert: "We do take an immense amount of pain. The emotional drain is huge. But often, the only reason we can bring [our footage] into the edited version is because we've gone through that emotional drainage. So I believe it's probably good for us, though on the day, it truly does hurt. It's like losing a family member. We have total respect for the end of an animal's life. We would never celebrate and go, 'Yay! We got it. Isn't that wonderful?' We totally do a little mourning ritual within ourselves just by being silent and being very respectful." Beverly Joubert: "Often with the audio, it is a challenge to get the audio at all times, especially when there's a huge amount of activity happening. And I might be assisting Dereck to try and capture it, as well as trying to capture still images. ... But the majority of the time, we would need to get what is there on the day. Otherwise, we might be miscommunicating what the lions were saying on the day. Even though we don't understand lion language, we do try to get it as accurate as possible."